The US Dollar snapped an eight-day winning streak and spent most of the Tuesday’s trading session in negative territory, helping the EUR/USD pair to stage a goodish bounce from three-month lows. Rising hopes of a breakthrough in the US-China trade talks boosted risk appetite in broader markets and was seen as one of the key factors prompting some USD profit-taking, especially after the recent run-up to the highest level since December. The risk-on mood remained supported news that the US lawmakers have reached a tentative budget deal to avert another partial government shutdown and got an additional boost after the US President Donald Trump said that he could let the March 1 tariff deadline to slide for a while. Hence, the key focus will remain on the high-level US-China trade talks, where the world's two largest economies attempt to reach a trade agreement. The pair built on the overnight bounce and continued gaining some positive traction through the Asian session on Wednesday, hitting a fresh weekly high level of 1.1342. It, however, remains to be seen if the recovery is backed by any genuine buying or is solely led by some short-covering amid concerns about the health of the Euro-zone's economic growth, which might have pushed back the ECB's planned rate hike to 2020. Moving ahead, today's release of Euro-zone industrial production data might provide some short-term trading impetus but the key highlight will be the release of the latest US consumer inflation figures, due later during the early North-American session. The headline CPI is expected to ease sharply to 1.5%y/y rate from 1.9% previous and the core reading is also forecasted to have ticked lower to 2.1%. Even the slightest of disappointment would be enough to continue prompting some follow-through USD long-unwinding trade and drive the pair higher. From a technical perspective, the overnight up-move lifted the pair beyond a confluence resistance - comprising of 100-hour SMA and 23.6% Fibonacci retracement level of the 1.1514-1.1258 recent downfall, and support prospects for additional near-term gains. Any subsequent up-move, however, now seems to confront some fresh supply near the 1.1350-60 region (38.2% Fibo. 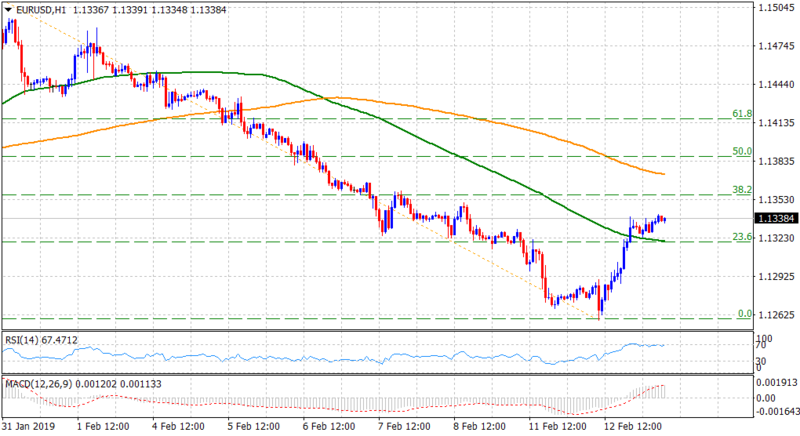 level), above which a fresh bout of short-covering could lift the pair further towards reclaiming the 1.1400 mark. The mentioned handle coincides with 50-day SMA and might keep a lid on any strong follow-through. On the flip side, the mentioned confluence resistance break-point, around the 1.1320 region, closely followed by the 1.1300 handle now seems to protect the immediate downside, which if broken should pave the way for an extension of the bearish trajectory further towards challenging November 2018 swing lows, around the 1.1215 region. A follow-through selling has the potential to continue dragging the pair further towards its next support near mid-1.1100s.